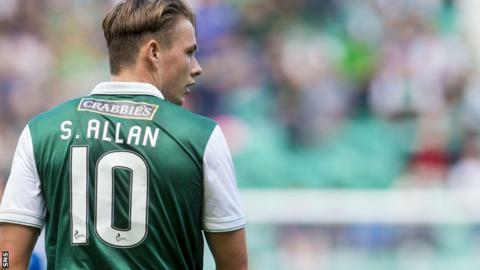 Rangers have made a third bid for Hibernian midfielder Scott Allan. Allan last month formally submitted a transfer request at Easter Road in the wake of the club rejecting two transfer bids from their Championship rivals. The Ibrox club's second offer last month for the playmaker amounted to £225,000 but Hibs said then that "the player will not be sold to Rangers". That offer was £50,000 more than Rangers' initial bid for the former West Brom and Dundee United player. The 23-year-old boyhood Rangers fan featured as a sub in the 6-2 defeat by Rangers in the Petrofac Training Cup.